You can use custom meeting templates to quickly schedule everything from coffee meetings to product demos. With each unique meeting template, you can specify the duration, availability, title, and location. 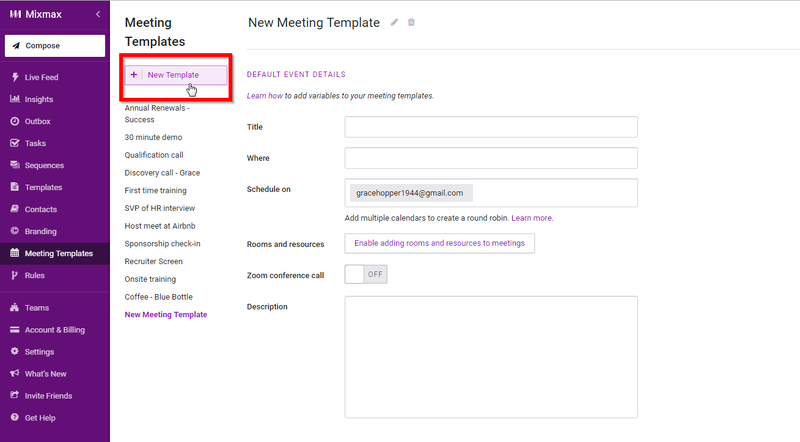 To create a custom meeting template, head to your Meeting Templates page and click the New Meeting Template button. This will open up a blank meeting template. Give it a unique name by editing in the top bar. These event details will display in the meeting confirmation window, and in the Mixmax invitation emails that go to you and your recipient. They’ll also be inserted into your Google Calendar event. They include the meeting title, location, calendar to schedule on, and meeting description. Ask guests to provide certain information by creating custom fields. It’s a great way to ask for phone numbers, preferred locations, website links, etc. The field responses will be added to the calendar event description. Guests will be prompted to fill out these fields when they follow your meeting template calendar link (see below). Fields are not shown when inserting availability directly into an email. Click the Add a field button, template the field label (the prompt your guests will see), and choose if the field is required. Click the ( + ) circle to add more fields, or the ( - ) circle to delete fields. Share this link so that guests can book directly on your meeting template calendar! Edit the link to make it easily memorable. Click View to visit your meeting template calendar, and Copy URL to share the link. This calendar is where guests will be prompted to fill out your custom fields (see above). If you fill out the Page Title section, that's what will show when your recipients go to the URL. If you leave the page title blank, the page will say "Schedule a Meeting with <<calendar name>>"
Set the availability you'd like for the meeting template. The checkbox next to the day indicates whether you'd like it included in your availability. Click the ( + ) circle to add multiple time windows. For more details on setting up your meeting template availability see Meeting Template Availability Settings. Prevent double-booking on other calendars you own or that are shared with you. This is powerful if you're scheduling an event for multiple people on your team and only want to offer times when everybody is available. Learn more about sharing calendars here. If this is a meeting template you're coordinating amongst a few different people, you can add them as default guests at the very bottom by typing in their email address. 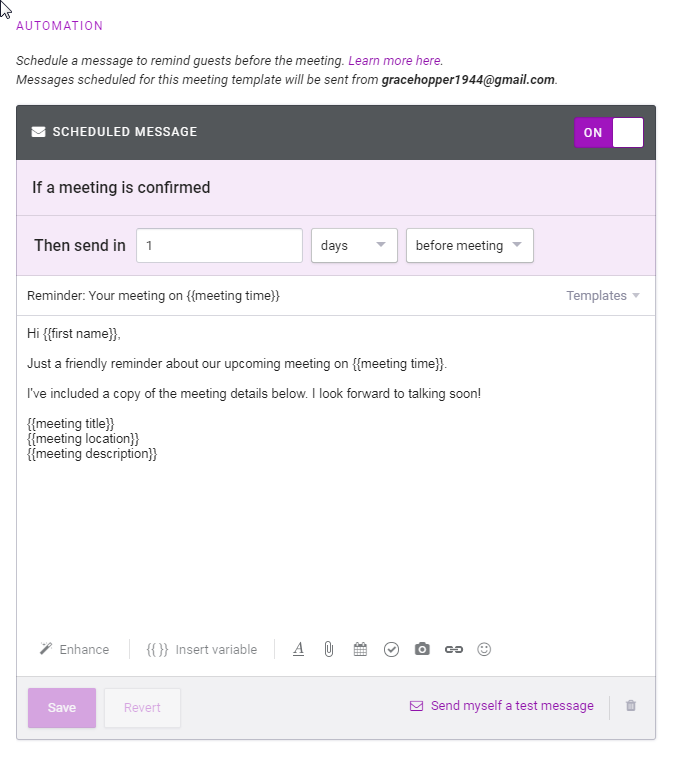 Schedule an automated message to remind guests about an upcoming meeting. Specify how many days before the meeting to send, compose the message, and make sure to turn the scheduled message “On” in the top right corner! Scheduled messages will be sent from the email address tied to your Mixmax account - you cannot send through an email alias. Learn more about automated reminders here. To use your new meeting template and send out availability to your recipients, open up a compose window and type /meeting. You'll immediately see a list of your available custom meetings to select from. 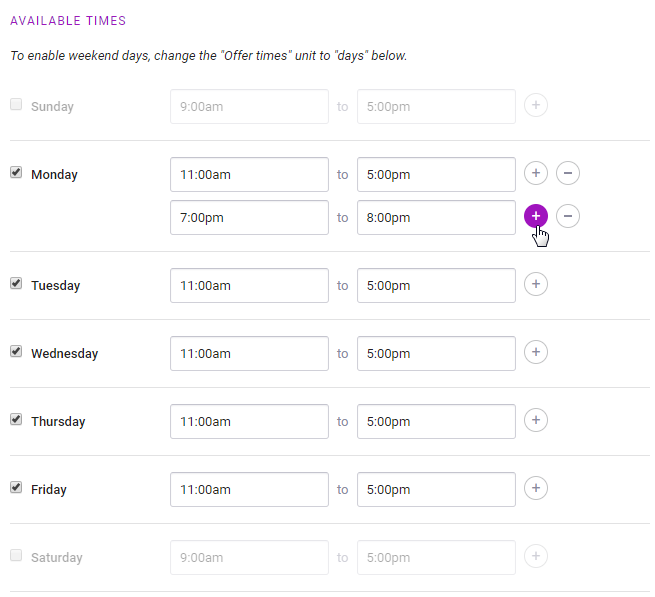 Choose the one you'd like and Mixmax will suggest meeting times that fall within the parameters you've set!